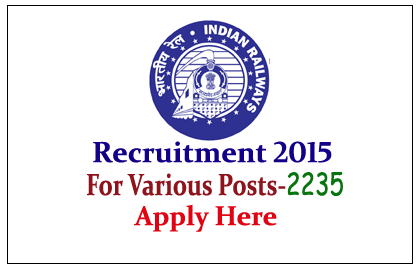 Indian Railway is recruiting for the post of Jr. Engineer, Sr. Section Engineer, Superintendent, Assistants and more posts. Total number of vacancies 2235. Interested and Eligible candidate can apply on or before 26th July 2015. Company Profile: Indian Railways is an Indian state-owned enterprise, owned and operated by the Government of India through the Ministry of Railways. How to Apply: Interested and eligible candidate can apply online on or before last date as mentioned below, for more details kindly check official notification.